Attracting a large audience especially at exhibitions can be challenging. Our popular and stylish pop up stand range is the perfect display solution for attracting visitors to your exhibition stand. We offer a wide range of pop up stand to enable you to find the perfect solution for any event requirements. We offer straight pop up stands, curved pop up stands, double sided pop up stands and linked pop ups stands for a larger more bespoke looking exhibition display. 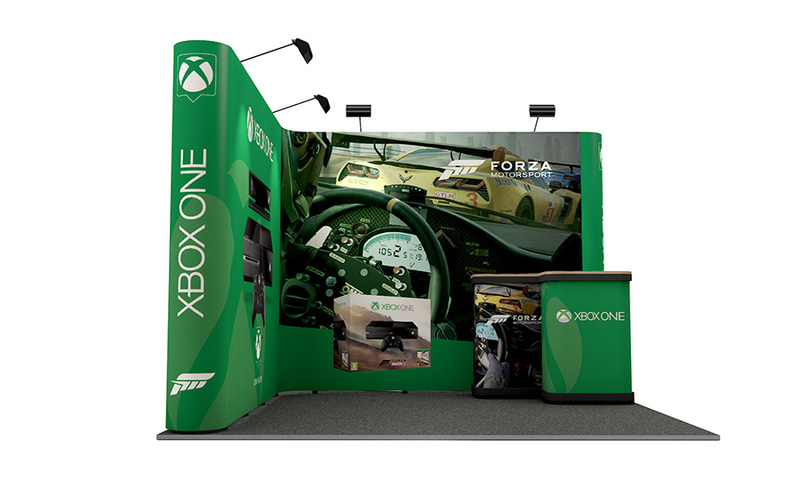 Pop up displays are so versatile they can be used for almost any event. They are a popular choice for shell scheme and space only exhibition stands. They can be set up in just a few minutes by one person, no tools or exhibition stand contractors are required. They are also simple to take down after your event allowing for a stress-free finish to your exhibition. Replacement graphics are available for any business who needs to change their marketing message. Our traditional pop up range can be purchased in two different shapes, our straight pop up display stand and our curved pop up display stand. These both have a choice of being a single/double sided configuration, so you can determine the angles in which your marketing message is displayed at. All of our pop up bundles now come with free LED lights. This free of charge upgrade can save you up to 60% on your exhibition stand electrics cost and socket requirements at your next trade show. The state of the art custom designed LED lights and utilise the latest LED die technology, for superior light output, efficiency, brightness, colour rendering and economical output - giving you the best results possible. 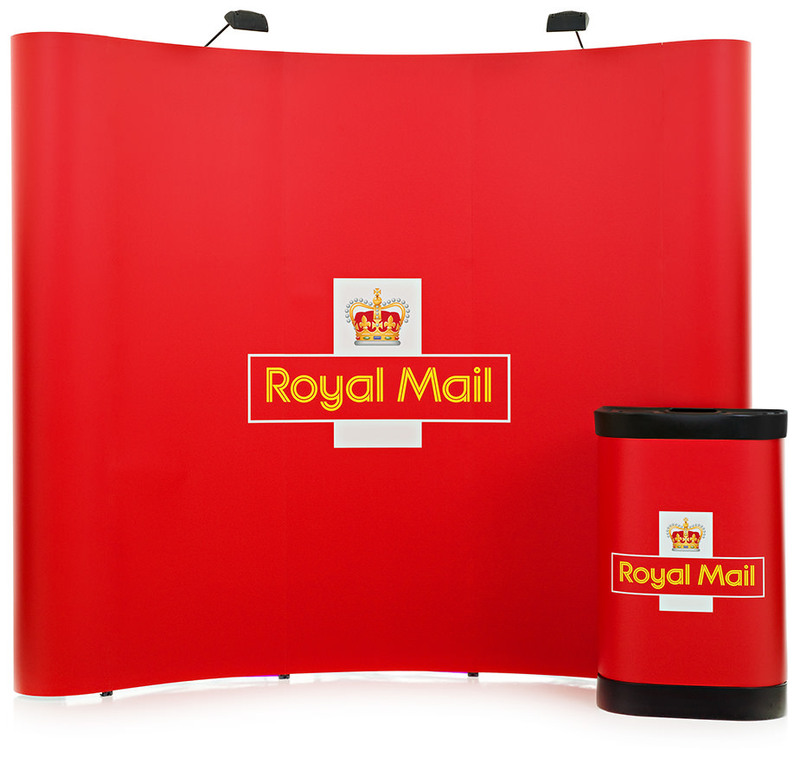 Our best selling pop up stands are available in 5 sizes - 3x12, 3x2, 3x3, 3x4 and 3x5. Supplied with an anodised aluminium frame, printed graphic panels, LED lights, wheeled transportation case, a graphic wrap and a folding beech top for the Zeus case. This transforms your Zeus case into a portable counter with extra space for marketing your brand. Printed in-house, the graphic panels are laminated for scratch, tear and crease resistant giving you longer lasting more vibrant artwork. We test build every pop up stand before dispatch to ensure the pop up is of the highest qulity. 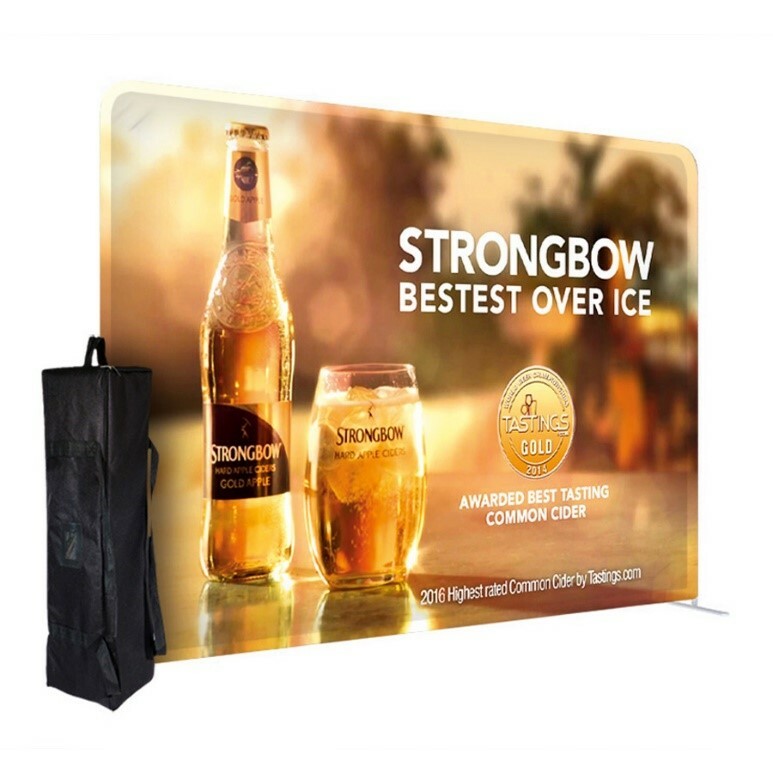 Straight Pop Up Display Stands are the ideal portable exhibition display system for an exhibition stand backdrop or display wall within a shell scheme or stand alone marketing display stand. Our straight pop up stands give maximum graphic area compared to a curved display and can be aligned against a wall for a seamless printed backdrop. Our 3x3 pop up stand is our best-selling portable display stand. Quick and easy to use, the 3x3 Pop Up Exhibition Stand gives high impact and a large marketing display area at a cost effective price. We dispatch our pop up stands in 72 Hours on receipt of print ready artwork. Enabling your marketing message to be ready just in time for your event, even if it has been left to the last minute! A great alternative to our straight pop up for a variation in shape is our curved pop up displays which are very stable and look extremely stunning when the graphics are attached. This type of display is available in different sizes and is quick and easy to assemble. If you require something more bespoke, you can create a large scale, custom built exhibition stand. With ingenious design and the clever use of linking panels, pop up stands can be joined together to create an exhibition stand to suit your needs perfectly. Our range of linked pop up stands introduces inspirational ideas of what can be achieved. The best selling kit is a 3m x 3m Exhibition Stand which comprises of 2 x 3x3 Straight Pop Up Stands linked together for a seamless edge to edge graphic display in an L-Shape configuration. Pop up stands can be linked together in various configurations – L-shape and U-shape are popular for shell scheme space. But it is possible to create all sorts of designs including back walls, islands, T-shapes and cross shapes, using both curved and straight pop ups. We can create a linked pop up system to fit any size exhibition stand space. The kits we offer online will fit stand spaces from 2m x 2m right up to 12m2 and everything in between. These kits include everything you need for the exhibition stand and the graphics are printed with your artwork. However, if one of these exhibition stands isn’t quite what you are looking for then use them as inspiration to see what can be achieved with pop ups and contact us for a bespoke quote. Reconfigurable and easy to use, this linked pop up exhibition stand provides maximum versatility. With cleverly designed artwork you can place your pop up stands in any order, or simply use them as individual pop up stands for smaller events. Fabric exhibition stands are a fast growing favourite for exhibitors who want to create an enticing display but wish to have something unique compared to the traditional pop up. These lightweight and portable texstyle displays are easy to assemble and come in a range of shapes and sizes to suit any exhibition stand. Our fabric exhibition stands provide stunning seamless back wall displays which are ideal for all exhibition applications. Our Formulate fabric display stands include a lightweight tubular aluminium frame with a tensioned fabric sock to provide a seamless backdrop display, ideal for any exhibition stand. The lightweight 30mm tubular aluminium structure can be assembled within minutes with the simple push fit motion. Not forgetting that they are one of the best selling ranges in the industry. The tension fabric graphics are printed with your artwork using a called dye sublimation printing process, where ink is placed directly into the weave of the fabric, giving a long-lasting, vibrant print. These display stands are a fantastic way of promoting your brand at events, exhibitions, trade shows, retail stores and even at photo shoots as a back wall. They are manufactured from a strong, yet lightweight tubular aluminium frame, which is dressed with a quality printed one-piece stretch fabric sock that simply slides over the frame, providing a professional seamless finish. Effortless to assemble, disassemble, store and transport, formulate fabric exhibition stands offer a professional and seamless finish with edge to edge marketing exposure. Designed to attract attention and increase footfall. Our hop up display stand is a portable lightweight system that is simple to install due to is hardwearing velcro simply attaching the graphic to the pop up frame. The simple tool free assembly allows for quick and easy installation. Once you are finished with the display you can simply release the locking arms and collapse the frame leaving the graphics attached to the frame. The hop up fabric displays use a similar frame to our best selling pop up stands but instead of polyester printed graphics, the artwork is printed onto display polyester fabric. The dye-sublimation printing process ensures maximum vibrancy and exceptional detail. It also ensures your artwork is longer lasting and can be machine washed to keep it looking fresh. Available in 5 sizes - 3x1, 3x2, 3x3, 3x4 and 3x5. Complete with a carry bag for easy transportation and storage. A great alternative to the hop up is the fabric SEG (silicone edged graphic) which features a silicone gasket that borders the fabric panel. The graphics on our SEG pop up are extremely taught, this means that time after time you use your pop up, they will always remain crease free. SEG Fabric Exhibition Stands can be joined together to create a larger display area, ideal for a shell scheme backdrop. Available in 4 sizes - 3x1, 3x2, 3x3 and 3x4. The SG Pop up stands offer all the same benefits of the traditional pop up stand but with more vibrant and attractive artwork. Printed onto polyester tension fabric graphics, the full colour rpnited artwork is of the highest quality for maximum brand impact. For more information about our Pop Up Stands and how they can work for you at your next exhibition please contact us or call 01733 511030.